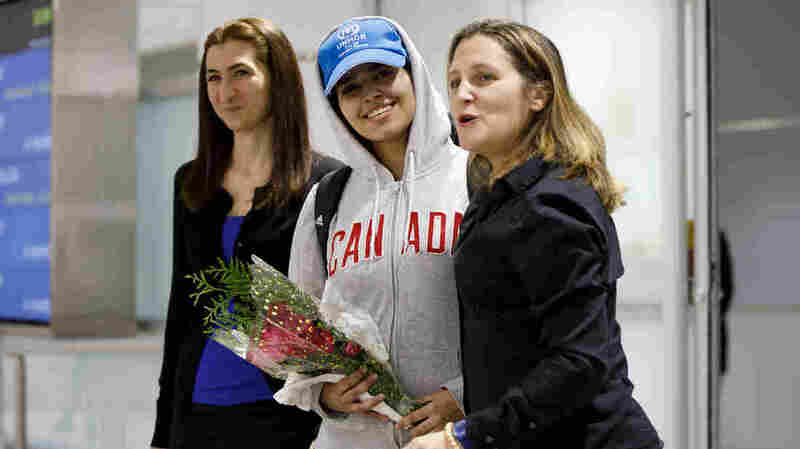 Young Woman Who Fled Saudi Arabia Arrives In Canada As Refugee Rahaf Mohammed Alqunun gained international attention when she locked herself in a Bangkok hotel room and tweeted that her family would kill her if she were deported to Saudi Arabia. Rahaf Mohammed Alqunun, arrives at Toronto Pearson International Airport, alongside Canadian minister of Foreign Affairs Chrystia Freeland on Sunday. Alqunun fled her family, saying she feared for her life, and was granted asylum by Canada. The 18-year-old Saudi woman who captured international attention as she resisted deportation from a Bangkok hotel room arrived in Canada on Saturday, in the final leg of a long journey to secure legal refuge. Foreign Minister Chrystia Freeland welcomed Rahaf Mohammed Alqunun in the Toronto Pearson International Airport, putting her arm around the smiling young woman, who had donned a Canada zip-up. "Canada was glad we were able to act quickly and to offer refuge to a refugee at the request of UNHCR," Freeland told reporters, referring to the United Nations High Commissioner for Refugees. "And to offer refuge to a person whose life was in danger." Canada granted asylum status to Alqunun on Friday. She flew to Toronto via Seoul, South Korea, according to Surachate Hakparn, Thailand's immigration police chief. Alqunun's story spread across social media when she locked herself in a Bangkok hotel room and live-tweeted her calls for help, rapidly gaining thousands of followers as she wrote that she was in danger. Alqunun arrived in Bangkok hoping to seek asylum in Australia, after fleeing her family while on vacation in Kuwait. Thai officials seized her passport, she said, but eventually returned it. In her first tweet, she wrote that the Saudi embassy was trying to force her to return home. "I'm afraid, my family WILL kill me," Alqunun wrote in another tweet. She said she had suffered physical abuse at the hands of family members and alleged they had tried to marry her off against her will, in a country where male relatives typically exert extraordinary control almost every aspect of a woman's life, including marriage, work, study and travel. Alqunun's father, whose name has not been released, has denied the allegations, the Associated Press reports. In a video that has been viewed over a million times, Alqunun told viewers last week that she wouldn't leave her hotel room until she was granted access to the UNHCR. "I want asylum," she said. Australia had said it was considering whether to offer her asylum, but the UNHCR suggested in an email to NPR that Ottawa moved more quickly. Kenneth Roth, executive director of Human Rights Watch, said Alqunun chose Canada over Australia because Canada had expedited her case. Freeland avoided answering a question on Sunday about the effect the asylum decision might have on relations between Saudi Arabia and Canada, which are already strained, they AP reports. Riyadh expelled Canada's ambassador last year and recalled its own top diplomat in Ottawa after Freeland criticized the jailing of two Saudi women activists. "Canada's welcoming of Rahaf is a fitting rebuke to the Saudi crown prince's temper tantrum against Canada for defending the rights of Saudi women," tweeted Roth on Sunday. He also called for Canada to redirect its attention to the jailed activists, now that Alqunun had arrived safely. The National Society for Human Rights, an organization closely associated with the Saudi government, tweeted after Alqunun's arrival that "some countries and international organizations" are politically motivated to "incite" female teenagers to leave their homes.